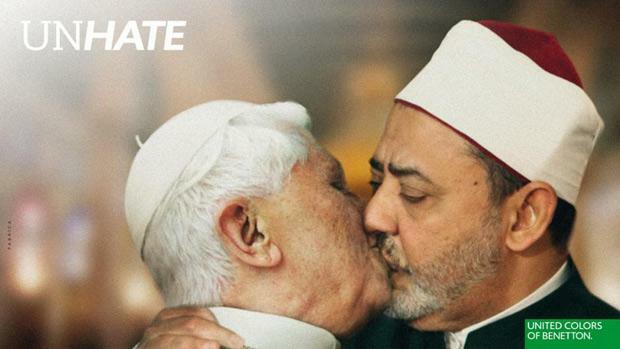 This week Benetton revealed its latest ad campaign, supporting the Unhate foundation, which features a number of politicians and religious figureheads kissing, including US president Barack Obama and Venezuelan President Hugo Chavez. However, the image that caused the greatest stir was that of Pope Benedict XVI kissing Mohammed Ahmed al-Tayeb, the grand Skeikh of Cairo’s al-Azhar mosque. The Vatican spokesman stated that the ad was a “grave disrespect” and denounced it as unacceptable provocation. “Shockvertising” is often considered to have been pioneered by Benetton, with past advertisements featuring images of prisoners on death row, a man dying of aids, a new born baby with its umbilical cord still attached and a trio of real human hearts, to name but a few. Nonetheless, many of Benetton’s controversial advertisements have also been the subject of much praise for heightening awareness of significant social issues. Yesterday, Benetton reaffirmed its support of the Unhate foundation, stating that “the meaning of the new campaign is exclusively to combat the culture of hatred in all its forms”. The son of Benetton’s founder emphasised that the campaign represents positivity and togetherness in the face of the world’s current political and economic instability.